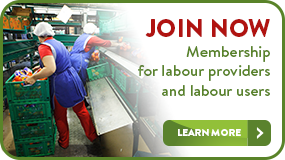 Labour providers play a vital role in the economy by supplying the workforce for the consumer goods supply chain across the food processing, horticultural and wider manufacturing, industrial, warehousing and distribution sectors. The Association of Labour Providers (ALP) is the specialist trade association promoting responsible recruitment for labour providers. ALP represents and supports its members to ensure that the provision, use and management of labour in our sectors is recognised as a model of good practice. ALP Members range from small local labour providers to the largest national multi-sector suppliers. All organisations in the supply chain are welcomed as Associate Members.